An account of a visit of Andrea Büchler - International surrogacy lawyer, Director of Center for Islamic and Middle Eastern Legal Studies, University of Zurich and a Fellow of the Collegium Helveticum in Zurich. Renowned International surrogacy lawyer, Professor Dr. Andrea Buechler from the university of Zurich, visited our Bangalore and Kochi center to know about surrogacy in India. It was our honor when she requested a visit to our hospitals to understand the way surrogacy procedures are arranged here in India. Andrea is a scholar and a social activist and wanted to find out how the surrogacy procedures are being conducted here in India. She personally interacted with the surrogate mothers present in our care during this time and inspected their quarters and enquired on their well being. 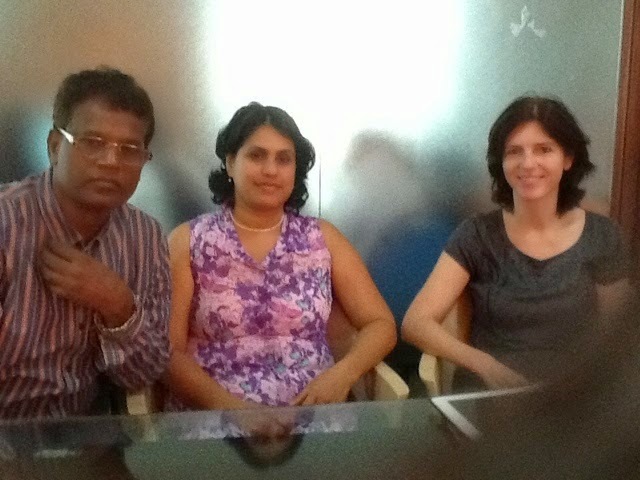 We had an interesting discussion with the Swiss professor on the topic “surrogacy in India”. It was indeed an eye opener for her, as the impression that she had from the documentaries she had watched was somewhat different from the reality in the field of surrogacy. She was quite surprised to know that the surrogates are given an option to stay either at their home or in the hospital during pregnancy. She was even more amazed when she came to know that often children of surrogate mothers stay with their mom in the hospital during the term of pregnancy, many of them get a chance to go to school from the remuneration received from being a surrogate. Dr. Andrea was impressed to see that the surrogate mothers are provided with all facilities including bath attached single rooms, cooking facilities/nutritious food, proper counseling and medical care, care takers etc. We were proud to inform her that, we offer one of the highest remuneration for our surrogate mothers in India. Dr Mani gave a few examples, where the couples were able to save their family by having a baby through surrogacy. The take away comment was awesome – she said she had not expected this and was under a very wrong impression about Indian Surrogacy Program. Her views were totally changed and she was happy to see the way things were proceeding and how we were able to make may Families Complete and happy, including that of the surrogate mothers. 1. In 2003, she was a founding member of the Center for Family Studies. 2. From 2003 to 2007 she was co director of the Competence Centre for Gender Studies at the University of Zurich. 3. Led the interdisciplinary and inter-institutional project "Children and Divorce - Current Legal Practices and Their Impact on Family Transitions" in the context of the Swiss National Science Foundation. 5. Director of the University Research focus "Asia and Europe - processes and problems of assimilation and differentiation in culture, law, religion and society" at the University of Zurich. 6. Since 2007 she is a scientific management training "Specialist Lawyer family law". 7. Since 2008 she is a lecturer in civil law at distance learning Switzerland. She was 2008/2009 Fellow at Berlin. 8. Since 2009, Andrea Büchler is Director of the Center for Islamic and Middle Eastern Legal Studies, University of Zurich and a Fellow of the Collegium Helveticum in Zurich.